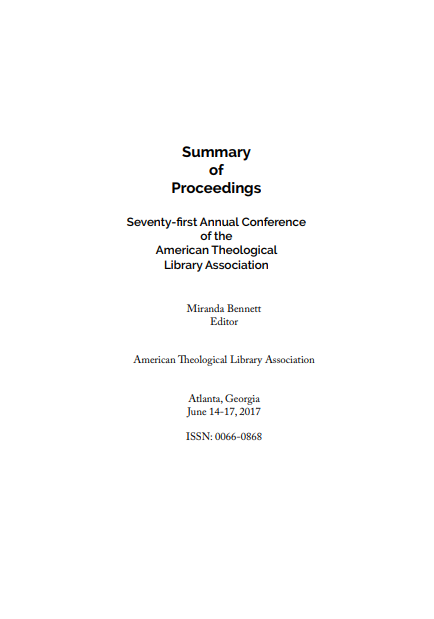 Relive the 71st ATLA Annual Conference in Atlanta, Georgia, by downloading a copy of the 2017 Summary of Proceedings. Edited by Miranda Bennett, this year’s Proceedings features papers, presentations, and panels from theological librarians including: “Information Literacy and Spiritual Formation,” by Ryan Douglas Shrauner; “The Human Rights of Muslims in the United States: How is the Question Irrelevant?” by Dr. Abdullahi Ahmed An-Na’im and Thad Horner; and “The Post-Custodial Theological Library: Developing a Community Archives Program with the Local Church,” by Dr. Julia Brock, Shanee’ Yvette Murrain, and Tigner Rand. The Proceedings also includes reports from the Denominational Groups, Interest Groups, and Committees; the organizational and membership directories; the Association of Theological Schools (ATS) and ATLA Library Statistical Report; and the Association Bylaws. This year’s Proceedings is available in EPUB and PDF versions and can be found online here. The full text of each edition of the Proceedings is also available in ATLASerials® (ATLAS®). Members may log in to access the Proceedings from 2011 to 2017 under the Community section. All Individual, Student, and Lifetime Members, as well as all Institutional and Affiliate Member Representatives, will receive a printed copy of the Proceedings. Printed editions were shipped the first week of March. Non-members may subscribe to the printed edition at $60 for domestic and $80 international per volume. Contact an ATLA membership associate for more information on subscribing.